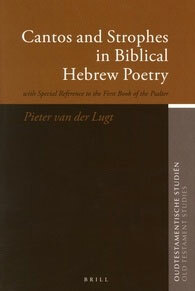 This volume deals with the poetic framework and material content of the book of Psalms. The rhetorical analyses of Psalms 1-41 are preceded by a broad survey of the history of strophic investigation into Hebrew poetry, starting from the beginning of the nineteenth century. Formal and thematic devices demonstrate that the psalms are composed of a consistent pattern of cantos (stanzas) and strophes. The formal devices include quantitative balance on the level of cantos in terms of the number of verselines, verbal repetitions and transition markers. A quantitative structural approach also helps to identify the focal message of the poems. An introduction to the design of biblical poetry, describing the fundamentals that determine the macrostructure of individual compositions, concludes this massive study.